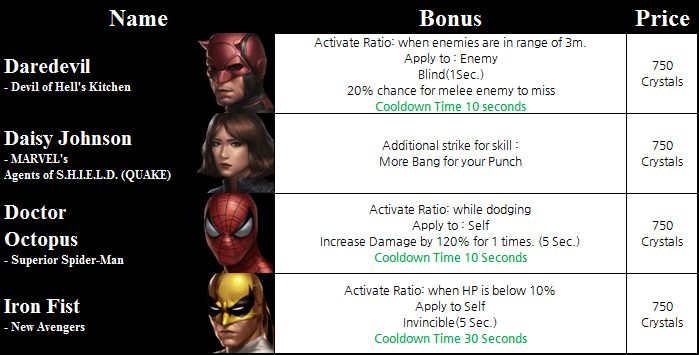 Patch 1.7 also adds level 6 skills for the following characters: Daredevil, Daisy Johnson, Lincoln Campbell, Sif, Deathlok, Phil Coulson, Malekith, Angela, Ultron, Mockingbird, and Doctor Octopus. At the moment, there is no word on how to unlock Jessica Jones, though she’s purchasable for 2,500 crystals in a package. Netmarble has never really been unfair to free to play players, so expect to see some sort of announcement for a new mission or to see her as a reward for Battleworld. I’ll make an edit to this post once more is announced. Marvel’s Jessica Jones will air its full first season on Netflix this Friday (November 20th). Marvel Future Fight is available for both iOS and Android. edit: Netmarble is running a weeklong log-in event for Jessica Jones biometrics. She can also be obtained through Combat biometrics.